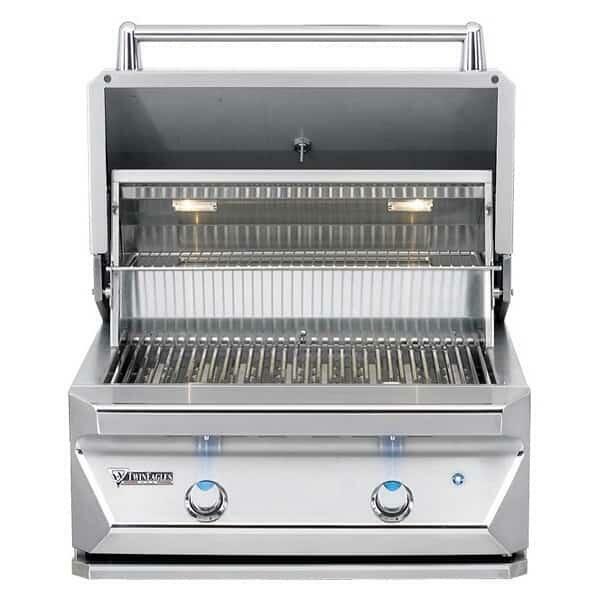 While the decorative blue LED lights in the control panel will put on a show even when not in use, the true attraction of 30" Outdoor Gas Grill Head from Twin Eagles Grills is the compact cooking power. This grill head offers 25,000 total BTUs placed under 513 square inches of cooking area, the perfect amount for creating a hot centerpiece to any outdoor kitchen or grill island. Twin Eagles was sure to pair this raw strength with extravagant beauty, offering a hood and a control panel that are not only double-walled for efficient control, but seamlessly welded for an unparalleled look. Many consider the combination of cooking power with a refined appearance to be the best in the grill industry. But if the looks and cooking power fail to convince your family's grill master, certainly the limited lifetime warranty, unmatched in the industry, will. So bring home the 30" Outdoor Gas Grill Head Only from Twin Eagles, which comes with free shipping nationwide from Family Leisure! Grilling Area 513 sq. in.